The Tally Dascom 1225 is a 24 pin, 136 column serial dot matrix printer with USB and parallel interfaces as standard. The wide carriage printer is perfect for industrial environments and front and back office applications. With low running costs, high quality output and an easy to use control panel it's ideal for low volume listing reports, invoices and other critical documents, as well as dispatch notes and labels. In addition to these applications, the 1225 is also well suited for measurement and control systems. 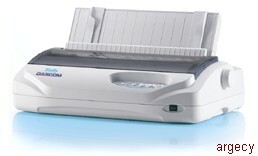 Amongst the lowest priced matrix printers available today the 1225 also offers a long life ribbon which means fewer ribbon changes, less downtime and lower running costs. Physical Size (HxWxD): 6.8" x 23.1" x 13.1"
Note For OCR applications it is recommended that your readers are tested with print samples supplied by DASCOM prior to purchase. Paper is a highly variable medium and should be tested prior to purchase. The quoted consumable life is the average for the printer when used under normal operation conditions.